Easter will be here shortly. we love to make sure the kids get a little something special, hower, it is not Christmas and it is not their birthdays, so we try NOT to go overboard. In our home to stick to three questions: Can I build it? Can I read it? Can I use it outside? Then we add in a couple of the kids favorite easter treats that only show up in stores this time of year. Chocolate bunnies, Peeps, and jelly beans. We love to make sure the kids have at least one religious book, and then two fun fiction books. We also like toys that can be used as a learning tool, or creativity outlet. This usually means arts supplies, legos, blocks, magformers, K’nex, and other toys that use STEM or STEAM abilities. Easter usually marks the better half of our Spring weather. So we like to utilize the nice weather to get the kids outside. We try to include outdoors toys. Things they can use in the pool, sprinklers, blow bubbles with, play ball with, or draw on the sidewalk with. Anything that can get them outside enjoying the outdoors and being physical is great! We try to keep the candy and food to a minimum. Especially since we attend an egg hunt at our church that includes candy inside of the Easter eggs. We scoped out a lot of other blogs for some fantastic basket themes and ideas for you. Some of our favorites came from Non Toy Gifts, Modern Sports Mom, and The DIY Village. 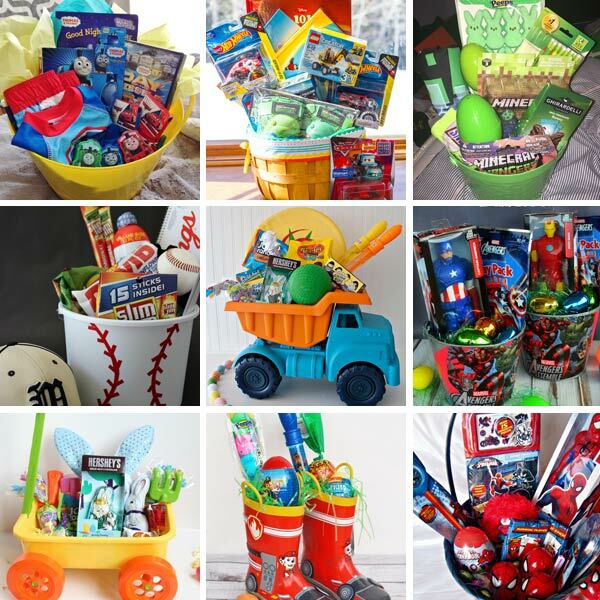 Each of these blogs offer multiple basket ideas for boys. They also each offer incredible ideas for various age groups, even teens! So be sure to check them out. You will be very happy you did. This entry was posted in Shopping and tagged Easter baskets, modern sports mom, non candy easter, non toy gifts, Shopping, the diy village, toddler easter on April 4, 2019 by Lacy.